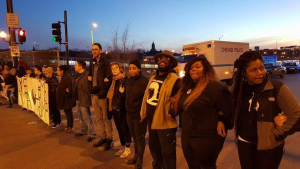 Several protesters were arrested protesting the Trump rally during an action organized by a coalition of young Black organizers from Assata’s Daughters and Black Lives Matter Chicago. We need to get them out. Read more here. Thanks to the support of over 1500 people, over $50,000 was raised in 36 hours to support the #TrumpRally and #ByeAnita protesters. Three people were released without monetary bonds. Two other protesters were charged with felonies and had bond set at $5,000 each by a judge on the afternoon of Sunday, March 13, 2016. A CCBF representative posted both bonds in full later that day, and Sergio and Sohaan were released shortly before midnight that same night. All unused funds will become part of the Chicago Community Bond Fund’s General Fund and will be used to free people from the Cook County Jail. If you have any questions, please feel contact us at info@chicagobond.org. To learn more about our work, or sign up for our mailing list, please visit us at chicagobond.org.